The Council for Australian Catholic Women has sent reminders and resources to each diocese in Australia to support the commemoration of the life and mission of Mary MacKillop. A copy of the resources is also available on the website of the National Office for the Participation of Women. The life and spirituality of Saint Mary of the Cross Mackillop was officially acclaimed by the Universal Church in her Canonisation on 17 October 2010 by Pope Benedict XVI. 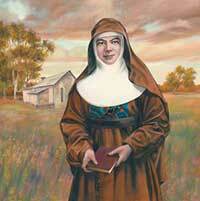 As well as being honoured as the founder of the Sisters of St Joseph, many schools and agencies claim Mary MacKillop as their patron. The Council for Australian Catholic Women (CACW) advises the Australian Catholic Bishops Conference through the Bishops Commission for Church Ministry. The CACW exists at the national level to ensure that the dignity of women is honoured and their gifts are given space to flourish for the sake of the Church’s life and mission (ACBC Social Justice Statement 2000).